If Rolls-Royce didn’t make a utility vehicle, it’d be leaving money on the table. It didn’t rush one out, though, the car has had a four-year-long development cycle. 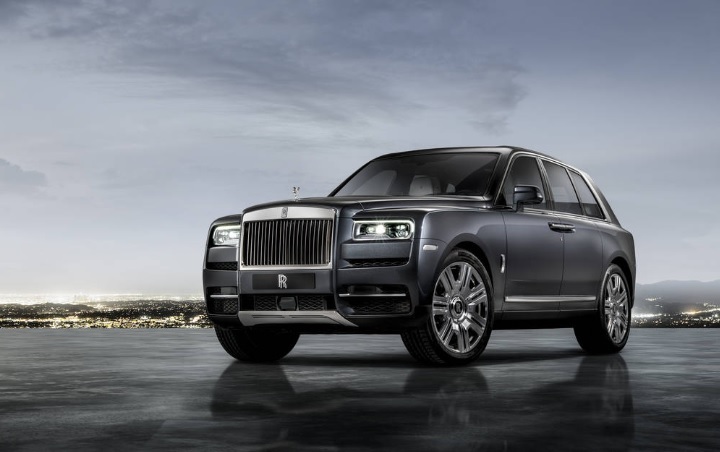 It might not be the first super-luxe automaker with an SUV in its lineup, but Rolls-Royce is determined to have the best one, and its name is Cullinan. 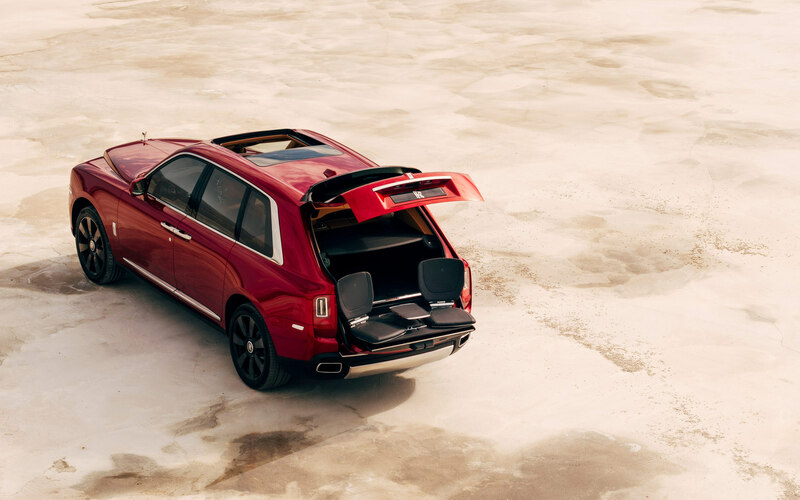 Rolls-Royce clearly wanted to make a car that embodies every inch of its badge, and it seems that the 2019 Cullinan fits the bill. 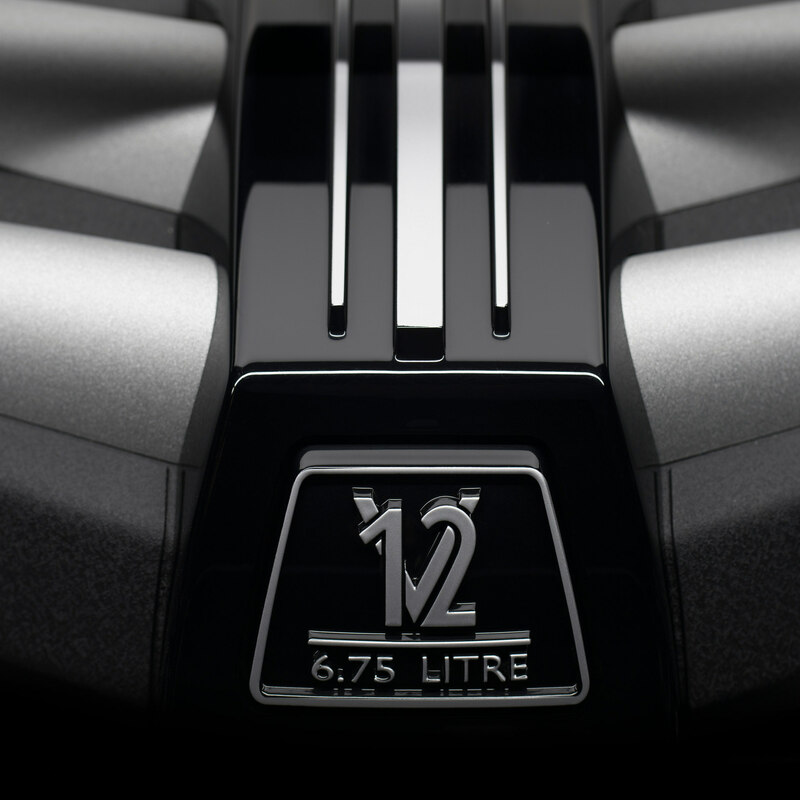 The Cullinan offers nearly every kind of bespoke feature you could imagine. The front end’s layout is similar to the eighth-generation Phantom’s, but the character lines are exaggerated. Everything is bulkier. The Spirit of Ecstasy hood ornament, a Rolls-Royce staple since the Bronze Age, is right where it should be. The chrome grille is a bit more understated than the Phantom’s, but the latter is still head of the family, after all. 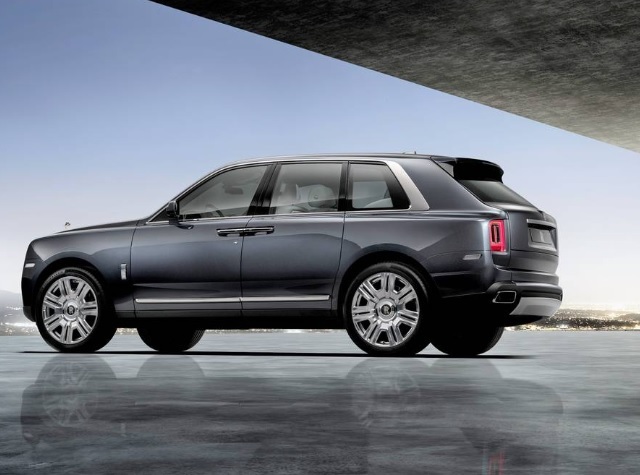 Out back, the Cullinan’s D-pillar is as beefy as the Phantom’s, but whereas the super-sedan’s has more of a curve to it, the Cullinan again takes the blockier approach. Open up the suicide doors and you’ll find an interior fit for the six-figure price tag. The dashboard layout is similar to that of the Phantom, but once again, there’s a bit more bulk and it lacks the Phantom’s ridiculous Gallery on the passenger side. The real treat is in the second row. The first configuration, called Lounge Seats, is a typical three-abreast layout with electronically folding rear seats where the headrests move up to avoid imprinting the leather. The second configuration is a bit more traditional. 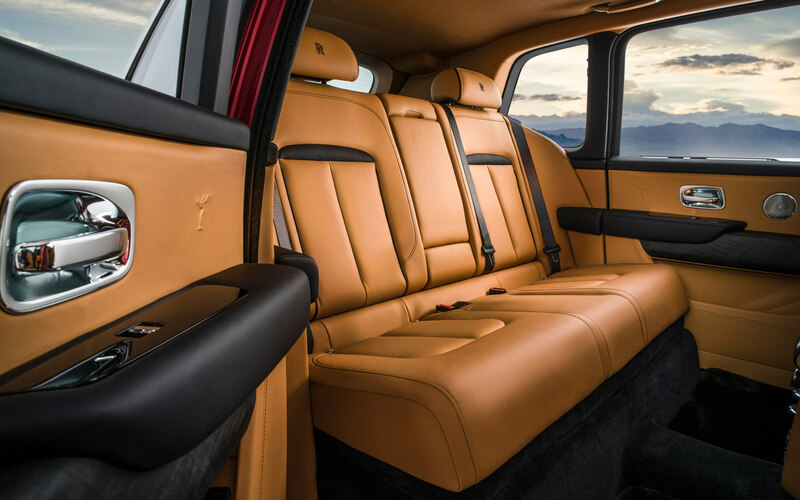 The Individual Seat layout has two separate rear seats with a large, permanent center console between the two that carries both whisky glasses and champagne flutes in addition to a refrigerator. There’s also a glass partition between the cargo area and the seats, so that one need not suffer the presence of luggage. Under that long hood is Rolls-Royce’s 6.75-liter, twin-turbocharged V12 putting out 563 horsepower and 627 pound-feet of torque. It’s sent to all four wheels through a transmission of some kind, Rolls-Royce didn’t say, but it’s probably the Phantom’s eight-speed automatic. Approach the Cullinan and it lowers about 1.5 inches to let you in, raising upon startup. 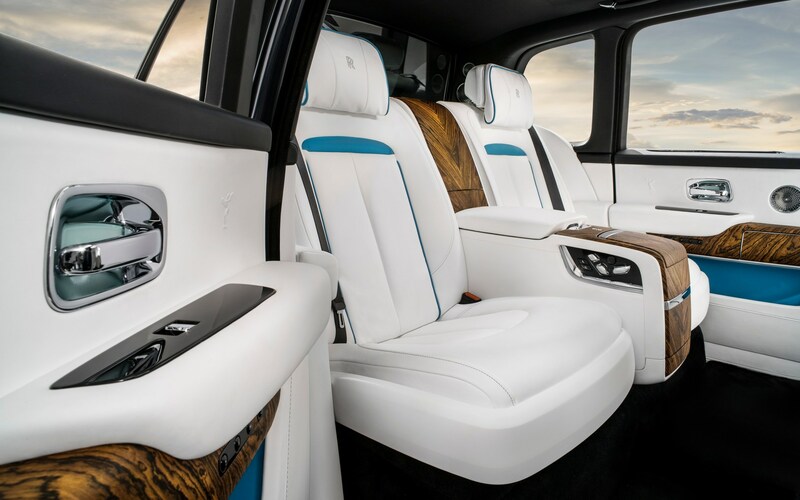 The air suspension has adaptive damping and was built specifically with some degree of off-roading in mind — but a Rolls-Royce kind of off-roading, where everything is still preternaturally smooth. A single off-road button on the dash is all it takes to prep the thing for the dirt. It’ll ford just over 21 inches of water, if you need it to. Following with the tradition of the latest BMW infotainment systems, the Cullinan’s in-dash tech now sports touch-capable operation, but there’s still a dial on the center console if you prefer. There’s also a touchscreen map for the rear. A Wi-Fi hotspot is available, but not in North America. Additional tech includes adaptive cruise control, night vision assist, a surround-view camera system, forward collision warning and a head-up display. Rolls-Royce’s Bespoke arm also has these things called Recreation Module. Each is tailored to an owner’s specific pastimes — the press release uses drone racing as an example. The module slots into the cargo area, and when it’s time to party, a motorized drawer opens up with everything you’ll need for said pursuit. 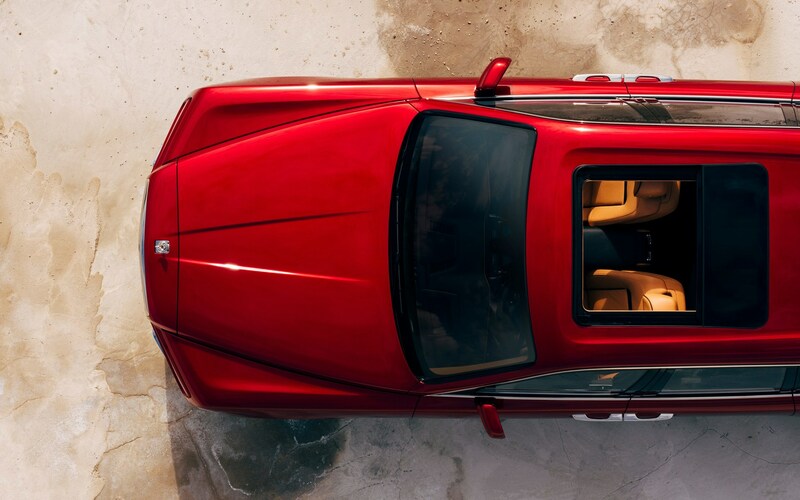 When it comes to Rolls-Royce, the sky’s the limit in terms of what you can spend on a vehicle. The Cullinan starts at $325,000.